The Fragile X Files: Oh no, don't make me read your BLOG! Oh no, don't make me read your BLOG! Here's where this photo came from. How did blogs get such a bad rap? Is it because they are free? And anything you don't have to pay for must be worthless? Is it because any fool can make one, and too many fools do? There are a few blogs out there that are SO good, though, that I can't believe I get to read them for free. I've paid good money for books and magazines that weren't nearly as well done as the blogs I list here. Of course, this is only my opinion, but I'm inspired by these blogs, so if you like what I write, you might like what they have to say as well. There's Autism and Oughtisms, for example. The author lives in New Zealand, and it's very well written and very relevant. She comments on autism in the news quite a bit, and she's spot on in her observations and commentary. And you can't not love Kelle at Enjoying the Small Things. You can't, it's like a blog world rule. Really good writing, and tons of gorgeous pictures. I love that her daughter has Down Syndrome but that's not what the blog is about. It's about life in Florida with kids. Period. The fact that she has a child with special needs is just a side note. She wrote a book and she has well over 17,000 followers at this point, so she needs my publicity like she needs a third eye. But there's a good reason people follow her. She's uplifting. Although I sort of want to push her down and slap her because her kids are always immaculate (or if they are dirty, it's adorable and perfectly arranged dirt) and her house is neat and quaint and funky and perfect, and she's skinny and beautiful and perfect. So much perfection. She must have a team of housekeepers and nannies that she locks in the basement when she gets her camera out. I also really like Jani's Journey. Jani is a little girl with child-onset schziophrenia, and I first heard about her on a Discovery Health program. The blog is written by her father and he's also written a book, which comes out next August. It's very honest and he says things I want to quote all the time. You know how it's both affirming and frustrating when someone writes something that is exactly what you think and feel, so much so that you can't help but be burning up inside with regret that you didn't think of it and write it first? That's what Flappiness Is does to me. I mean that in a good way. Jason Good 365 is just so funny. It's not about children or autism or special needs of any kind, it's just about his life as a husband and dad and it's great. Over 5,000 people on Facebook "like" him and I'm one of them. He's never, ever, ever boring. 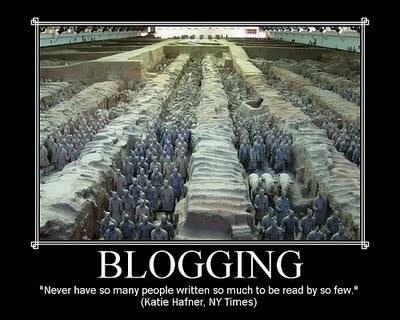 How many people/blogs/books/magazines can you say that about?